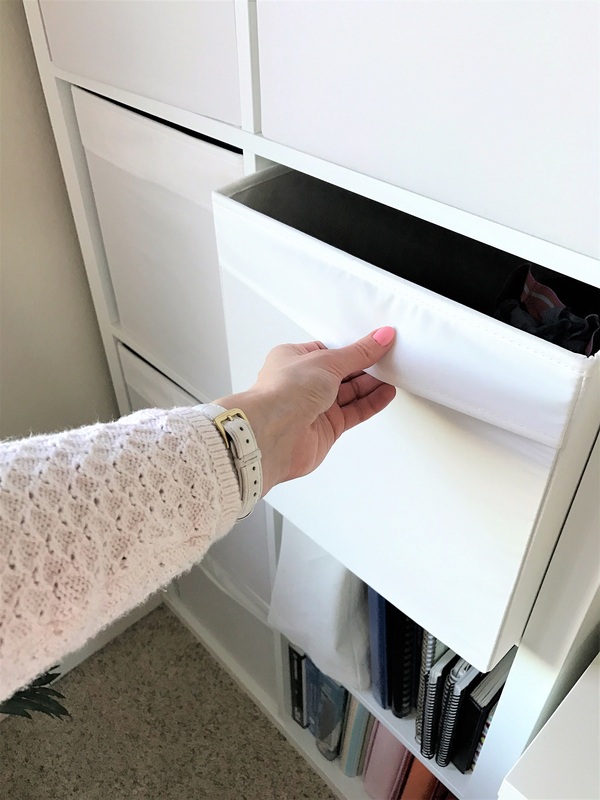 For those of you who live in a small space like I do, you know that keeping things organized can be a challenge. Between collecting clothes and adding to my ever growing craft supply, my things started to consume me. 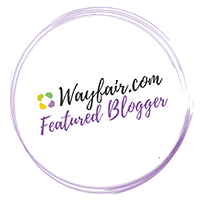 I had items stuffed under my bed, shoved into my closet (and the laundry closet… and the coat closet…), and lying all over my desk. It was driving me crazy, and I knew it was time for a change. This is my closet… it’s not the largest space (yes, this is really all there is, it only goes about one foot beyond what you can’t see on the left and the right), so I really only have hanging space and room for shoes. Things like crafts, undergarments, and decorations have no place in there. Go through your stuff. This means little stuff, like clothing, craft supplies, tools, etc. Do you need it? Do you love it? If the answer is no to either of these questions, donate it or throw it out. Things like chargers for phones you no longer have, sheets with stains on them that you save just in case you don’t do laundry for months, and scraps of paper that could only be used to make confetti are probably good items to toss. Once you have decided what items to keep, organize them by type. Paper crafts, sewing crafts, electronics, bedding, tools, gift wrapping, and office supplies were among the categories I had. Now that your things are organized, do you have a place to put them all together? It is best to keep your categories stored in one place. That way you always know what you have and don’t run the risk of shoving things into dark corners where they will be wasted and lost forever. If you do not have a place for something, move to step 4. Don’t have space for something? Time to reevaluate your furniture and storage solutions. This might be as simple as buying under the bed bins, stacking boxes for your closet, or putting dividers in your drawers. It could also mean that you don’t have the right furniture pieces or the ones that you have aren’t serving the right purpose. After going through these steps, I had thrown out tons of junk and moved supplies into singular spaces. As much as I loved having all of my clothing in my closet, it just wasn’t big enough to hold everything. I also found that my desk was essentially only being used as a table top for sewing and to hold my TV, and provided me with no storage for crafts and office supplies like I needed it to. 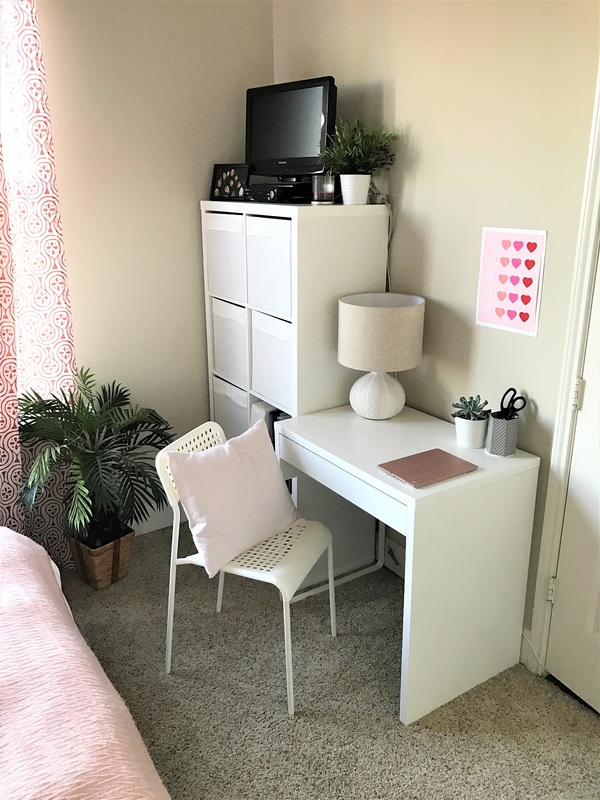 In order to resolve these issues, I measured the space where my large desk was and found that I could fit a much smaller desk which was perfect for my sewing machine or computer, and a bookshelf with lots of storage and space for my TV on top. These fabric bins are perfect for storing socks, tee shirts, workout clothes, office supplies, and electrical cords. 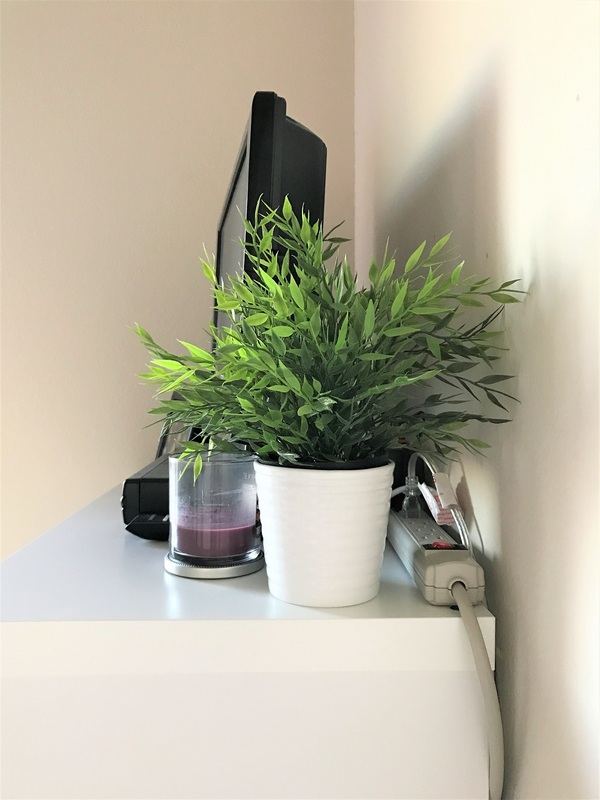 I also hid a power cord in a convenient spot for plugging in my sewing machine, laptop, and lamp – no more climbing under the desk! 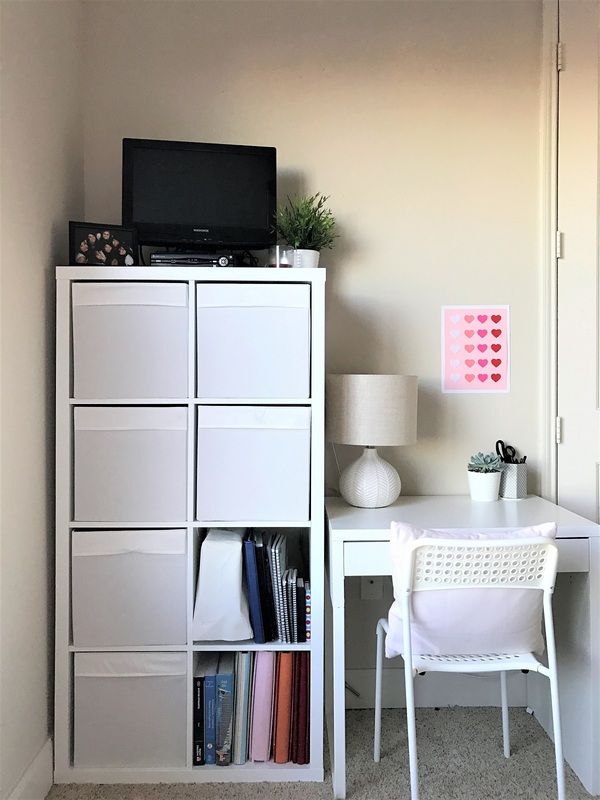 I put together a mood board (below) with some of the furniture and accessories I used in my new study/storage nook in case you’re interested. I bought all of the furniture and storage pieces for around $170 which was a steal! It feels so rewarding to have cleansed my life of junk and gotten organized. It also makes every day so much easier to know exactly where everything is and where to put new things so that my desk doesn’t become a dumping ground. Do you have spring cleaning plans? I tend to do mine early so I can enjoy the better weather once it gets here! I love spring cleaning!! Great post! 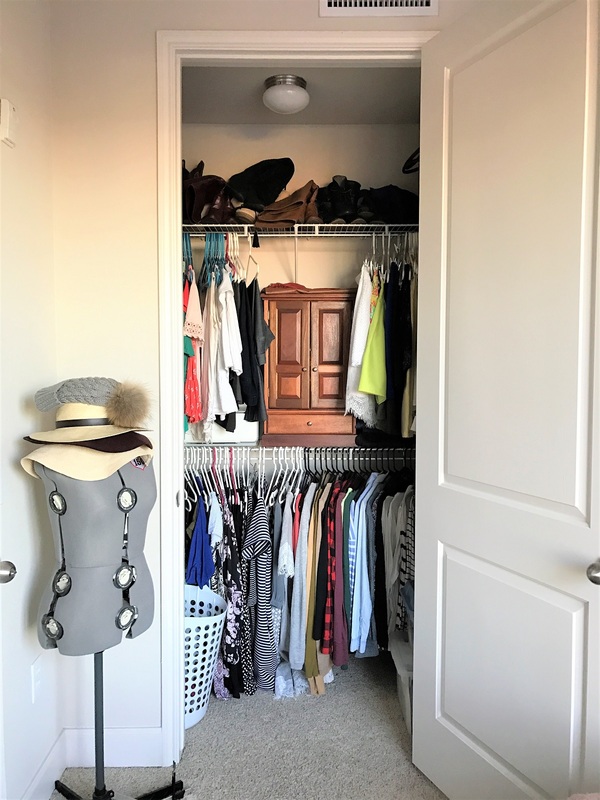 I’m inspired to do the same with my closet – spring cleaning! Thanks, Julia! I’m so glad! I really feel better being so organized – giving everything a place has helped me so much day to day.